It’s been a long time coming, but I THINK spring is finally here. The snow is completely gone… EVERYWHERE… even in the woods!!! All that deep snow disappeared amazingly fast, melting in days instead of the usual weeks. We have had only one day of really warm spring-like temperatures so far, but having no snow makes such a difference. Our hand-dug ponds were covered with thick ice less than two weeks ago, but the ice has completely melted and we’re starting to see lots of frogs again. Three days ago we were pleased to hear them “singing” for the first time, and the sound is getting louder every day as more and more frogs join in. Soon the surface of the water will be almost covered with eggs. 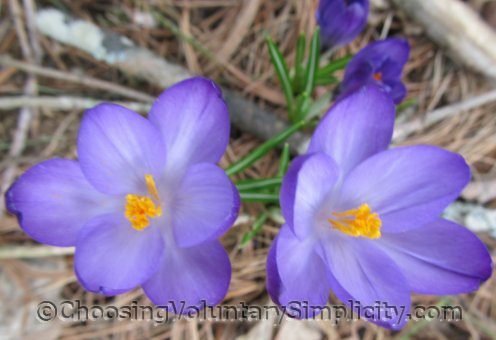 I’m finding flowers… and as always, the crocuses are popping up in the most unexpected places. These plants never stay where I wanted them to grow, but it’s a welcome sight this time of year to find them anywhere. 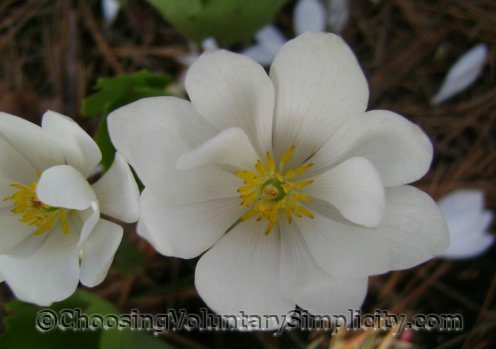 The bloodroot is beautiful today with all of the petals open in the bright sun. They have been budded for a few days, but the petals haven’t been open because it has been mostly cloudy. The lungwort is blossoming everywhere. This time of year I welcome its blue and pink flowers wherever it has decided to take root. Later on in the season is plenty of time for wishing it grew less enthusiastically around here. 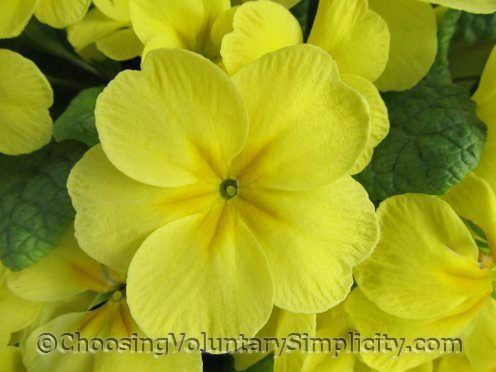 The primroses, of course, have been flowering under the snow for much of the winter, but the plants are heavy now with flowers and new buds. 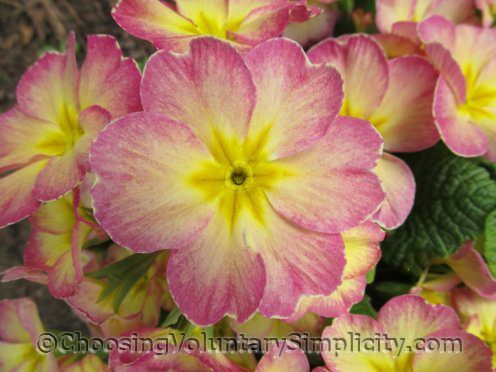 I love primroses! And in the woods, the hepaticas are starting to bloom. The bears are on the move and are very vocal as they search for a mate. Their call is three long, drawn-out hoo’s, repeated again and again for literally hours at a time. The calls sound closer or further away as the bears move through the woods. Yesterday we could hear a bear in the woods across the road from our house being answered by another bear in the woods behind our house. Some of the calls sounded alarmingly close… so close, in fact, that a neighbor walking past said it sounded like one of the bears was on our back porch. Happily, this time that wasn’t true. Every spring since the first year we built this house, little Phoebe birds have built a nest on the outside top ledge of the large bow window in our living room. They raise two families of babies each year… last year they raised three… in this safe, protected spot. 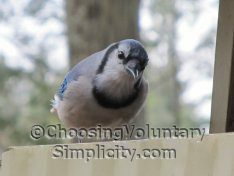 It is a little early for eggs and babies yet, but for the last three or four days the birds have been busily working on the nest. I can’t imagine hearing bears the way you do. You are so matter of fact about it. It must be quite an experience to hear them or see them. We have a bird who has built a nest on our window ledge for a number of years too and we look for it to come each year. They arrived yesterday and are busy building so I can echo your spring is here. Ohhhh — I’m so jealous of you! We still have snow everywhere and the temperatures are still cold. I am so looking forward to spring. Sounds a lot like what’s going on in our neck of the woods–except for the bears! Bears freak me out a bit, and though we have them around and do see them on occasion, I’m glad that we don’t see or hear a lot of them. I’m afraid I might lock myself in the house in terror if I heard one outside! Our hepatica are just starting to bloom. Spring seems like it’s been a long time coming…so glad to have it here!